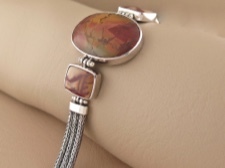 Three unique red creek jasper stones set in sterling silver and joined together with sterling silver chain. 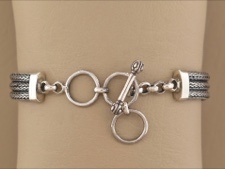 This bracelet has a toggle closure that can adjust from 6.25, to 6.75, to 7.25 inches. 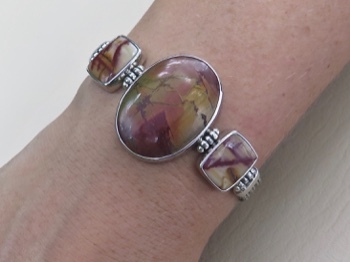 Discovered in the Red River in China, these unique stones are not really jasper at all, but their markings are similar to many jasper varieties. Loved for its wonderful shades of rust, ochre, taupe and gray, this mix of warm and cool tones blend so well together.